This Creamy Tuna Mornay recipe base makes a family pasta favourite with tuna in a cheese sauce, finished under the grill with a golden cheese top. All of our Continental Recipe Bases contain no artificial colours, flavours and added MSG, and are made with real ingredients, simply dried and combined to create a perfectly balanced flavour for your favourite dish. Corn starch, wheat flour, cheese powder, natural flavours (contain milk derivative), salt, yeast extract, sunflower oil, onion powder, maltodextrin (from wheat), parsley, natural colour (carotene), turmeric. Preparation time: 5 minutes Cooking time: 25 minutes Just Add: 425g can tuna 250mL milk 115g spiral pasta 80g corn kernels 60g grated cheese Simply... 1. Combine Recipe Base, 2 cups (500mL) water, 1 cup (250mL) milk and 1 1/2 cups (115g) spiral pasta in a medium saucepan and stir until boiling. Simmer for 12 minutes, stirring regularly. 2. Stir through 1/2 cup corn kernels and 1 x 425g can tuna in springwater, drained; and reheat. 3. 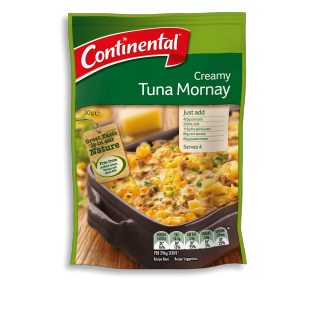 Spoon tuna mornay into an ovenproof dish. Top with 1/2 cup grated cheese and brown under a grill. Serve with a tossed green salad. Here's an idea... For a crunchier topping, mix 1/2 cup fresh breadcrumbs with the cheese and brown under the grill.